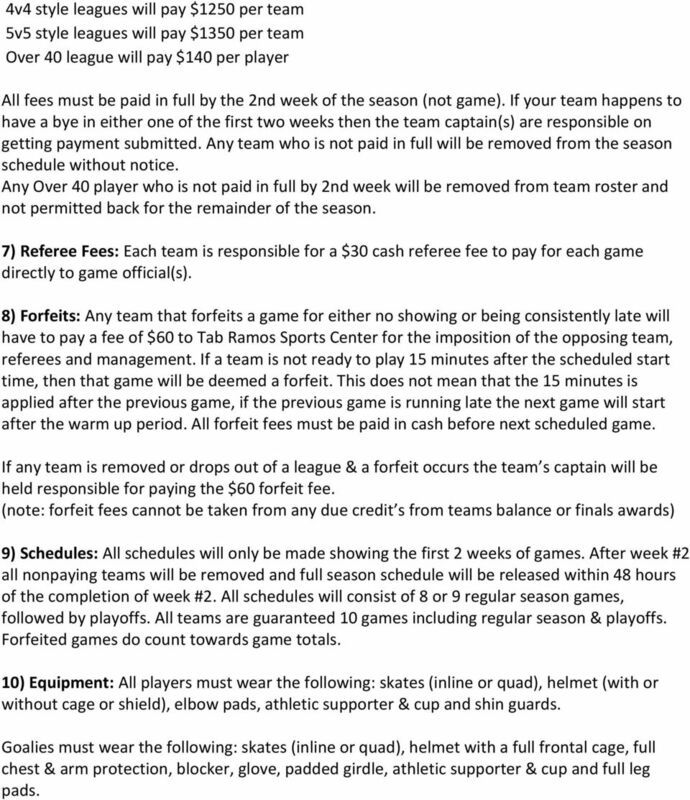 Download "Tab Ramos Sports Center Adult Roller Hockey Rules & Regulations"
2 4v4 style leagues will pay $1250 per team 5v5 style leagues will pay $1350 per team Over 40 league will pay $140 per player All fees must be paid in full by the 2nd week of the season (not game). If your team happens to have a bye in either one of the first two weeks then the team captain(s) are responsible on getting payment submitted. Any team who is not paid in full will be removed from the season schedule without notice. 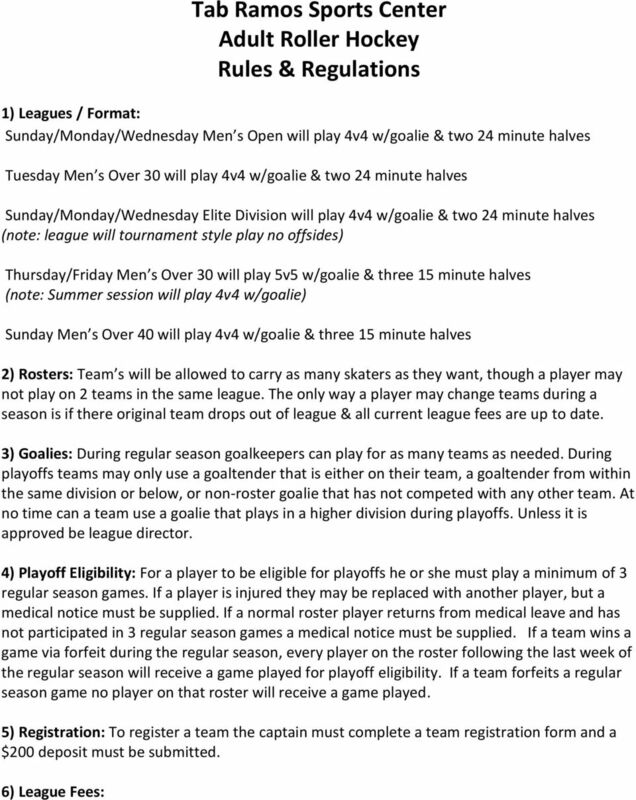 Any Over 40 player who is not paid in full by 2nd week will be removed from team roster and not permitted back for the remainder of the season. 7) Referee Fees: Each team is responsible for a $30 cash referee fee to pay for each game directly to game official(s). 8) Forfeits: Any team that forfeits a game for either no showing or being consistently late will have to pay a fee of $60 to Tab Ramos Sports Center for the imposition of the opposing team, referees and management. If a team is not ready to play 15 minutes after the scheduled start time, then that game will be deemed a forfeit. This does not mean that the 15 minutes is applied after the previous game, if the previous game is running late the next game will start after the warm up period. All forfeit fees must be paid in cash before next scheduled game. If any team is removed or drops out of a league & a forfeit occurs the team s captain will be held responsible for paying the $60 forfeit fee. (note: forfeit fees cannot be taken from any due credit s from teams balance or finals awards) 9) Schedules: All schedules will only be made showing the first 2 weeks of games. After week #2 all nonpaying teams will be removed and full season schedule will be released within 48 hours of the completion of week #2. All schedules will consist of 8 or 9 regular season games, followed by playoffs. All teams are guaranteed 10 games including regular season & playoffs. Forfeited games do count towards game totals. 10) Equipment: All players must wear the following: skates (inline or quad), helmet (with or without cage or shield), elbow pads, athletic supporter & cup and shin guards. Goalies must wear the following: skates (inline or quad), helmet with a full frontal cage, full chest & arm protection, blocker, glove, padded girdle, athletic supporter & cup and full leg pads. 4 2 times in a row. During sudden death teams do not have to use their entire roster. 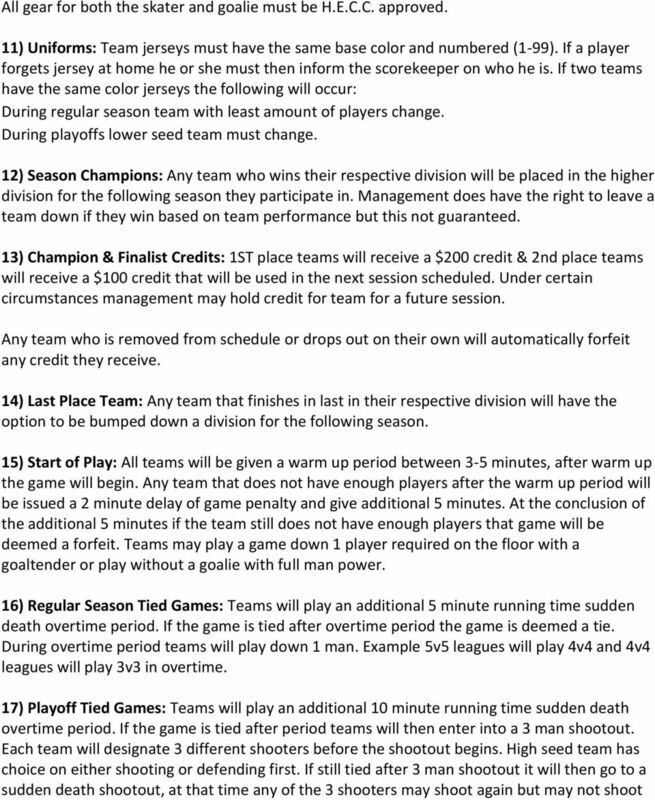 18) Overtime Penalty Format: For the 5v5 league we will be using the NHL standard penalty system. When 1 player is in the penalty box game play will be 4 on 3. When 2 players are in the penalty box game play will be 5 on 3. Once the first or both penalties expire teams will resume 4 on 4 play at next stoppage. For the 4v4 leagues same format will follow but it will be on 3 on2 for 1 penalty and 4 on 2 when there are 2 penalties. 19) Mercy Rule: After a team is leading by 10 goals the game will be considered over and the score at that point will be final. Both teams may continue playing on the floor until game time expires. Referees do not have to stay on the floor. 20) Termination of Penalty Times: At the termination of penalty time on the scoreboard the player must exit the penalty box onto the floor and can either enter play or go to the bench for a change (the player must touch the floor not jump penalty box board into bench). If the penalty expires during a stoppage of play the player must wait till the next drop of the puck to be able to exit the penalty box. 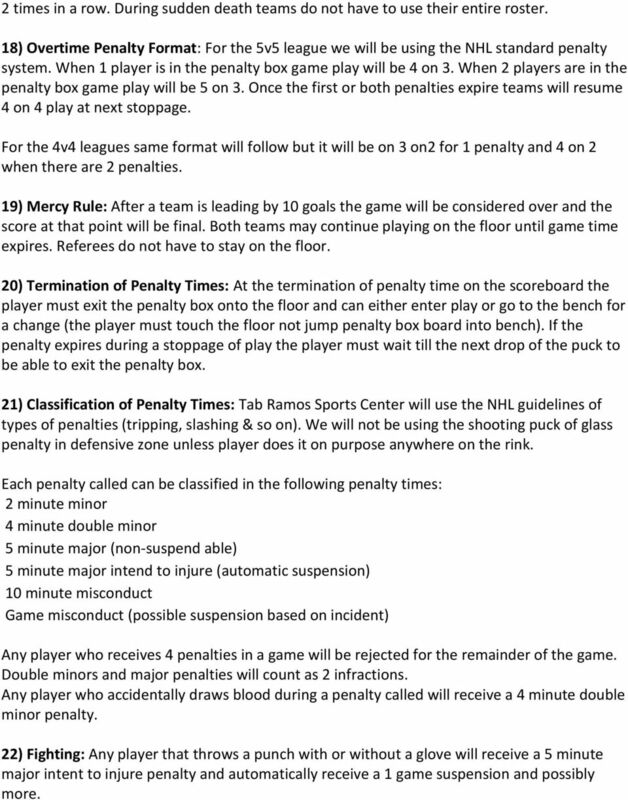 21) Classification of Penalty Times: Tab Ramos Sports Center will use the NHL guidelines of types of penalties (tripping, slashing & so on). We will not be using the shooting puck of glass penalty in defensive zone unless player does it on purpose anywhere on the rink. Each penalty called can be classified in the following penalty times: 2 minute minor 4 minute double minor 5 minute major (non-suspend able) 5 minute major intend to injure (automatic suspension) 10 minute misconduct Game misconduct (possible suspension based on incident) Any player who receives 4 penalties in a game will be rejected for the remainder of the game. Double minors and major penalties will count as 2 infractions. Any player who accidentally draws blood during a penalty called will receive a 4 minute double minor penalty. 22) Fighting: Any player that throws a punch with or without a glove will receive a 5 minute major intent to injure penalty and automatically receive a 1 game suspension and possibly more. 5 23) Third Man: Any player that enters an altercation will receive an automatic game misconduct with the possibility of a game suspension. 24) Leaving the Bench: Any player who leaves the bench during an altercation will receive an automatic game misconduct with the possibility of a game suspension. 25) Suspension Notice: If a player receives a major intent to injure penalty or game misconduct it is the captain s responsibility to contact management to see if that player(s) is suspended. Notice will also be posted on website. 26) Off sides Expanded zone This age division will be playing blue line in and red line out. The entire puck must be over the blue line going into the attacking zone before any player may enter the zone, at this point the offensive zone expands and now the attacking zone becomes the entire halve of the rink from the red line in. Clearing the zone the entire puck must be completely over the red line in the neutral zone before the attacking team must exit the original non-expanded zone (back to the blue line.) 27) Icing non-touch up icing. A player deliberately clearing the puck from behind the defensive blue line with the puck reaching the offensive zone goal line. 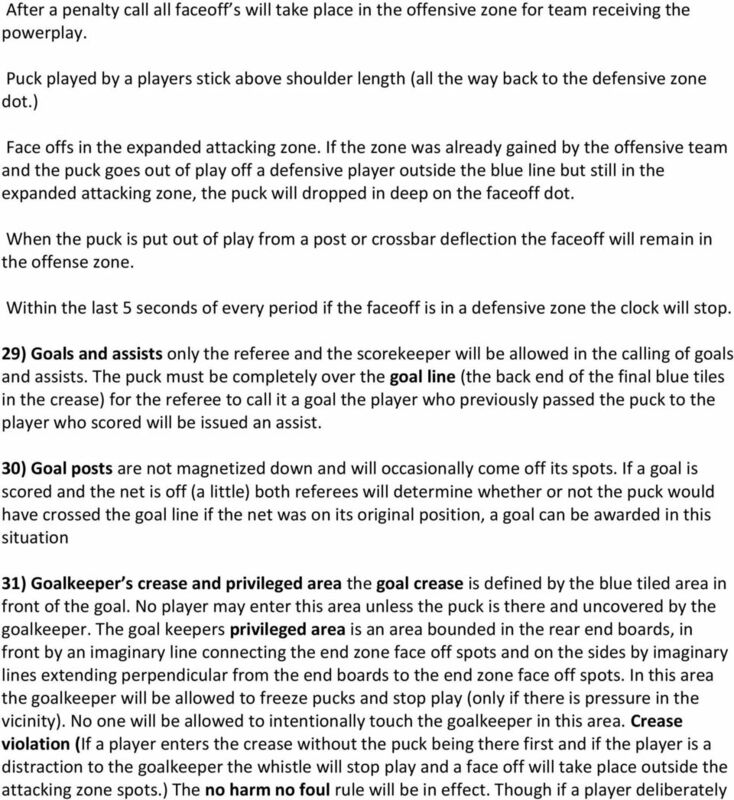 At the discretion of the referee if the player was intending to make a pass to a teammate that was not completed but the result of the play lead the puck behind the opposing teams goal line the icing may be waved off, or if the defensive team has a play on the puck before it reaches the icing position and refuses to play the puck the icing also will be wave off. Icing is only played in the Over 30 Silver and Bronze divisions. 28) Face offs All face offs at the start of the game, periods, and after goals will take place at the center rink face off dot. All other face off drops will take place according to the situation. Goalkeeper save (low attacking zone spot on the side the shot came from) Off sides (on one of the face off dots outside the attacking zone or where the pass originated from) Icing (on one of the defensive zone dots where the clearing came from) Deflection out of play including puck striking the nets above the glass. Faceoff will take place at the closest faceoff dot. 7 makes contact with a goalkeeper inside or outside of the crease area a minor penalty can be assessed. 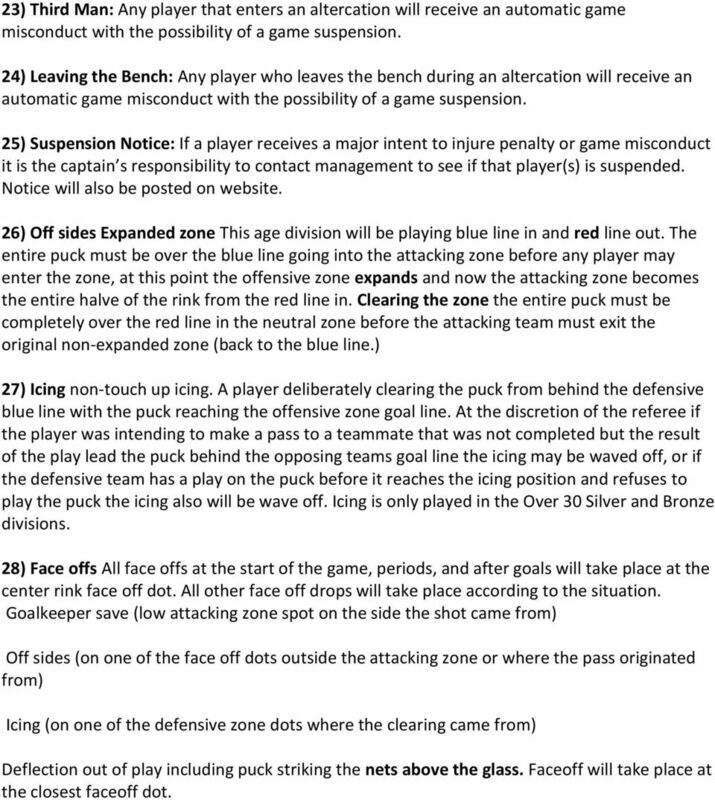 32) Hand passes Legal when started and completed in the defensive zone 33) Referees The Referee shall have general supervision of the game and shall have full control over, Team officials and players before, during and after the game, on and off the rink surface. In case of any dispute, the decision of the referee shall be final. 34) Point Sytem Winning Team Will Receive 2 Points Overtime Losing Team Will Receive 1 Point Tied Game Both Teams Will Receive 1 Point Losing Team during Regulation Will Receive 0 Points 35) Tie Breakers: 1. Head to Head 2. Goals Against 3. Goals For 4. Goals Against In First Regular Season Game 5. 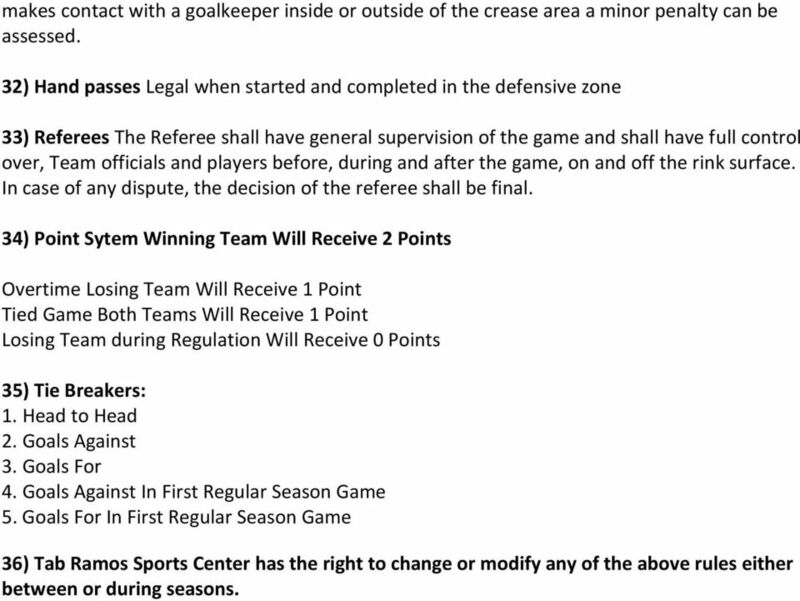 Goals For In First Regular Season Game 36) Tab Ramos Sports Center has the right to change or modify any of the above rules either between or during seasons. THE BASICS. BREAKAWAY A clear scoring opportunity where no defensive player is between the puck carrier and the goaltender. 2) Banned substances a) Chewing tobacco, tobacco products, alcohol, and illegal drugs prohibited at all league games. HOCKEY MADE SIMPLE. Offsides: When any member of the attacking team precedes the puck over the defending team's blue line. HOCKEY MADE SIMPLE Goaltender: The goalie's primary task is simple - keep the puck out of her own net. Offensively, she might start his team down the ice with a pass, but seldom does she leave the net.